Halloween Party Kicks off in League of Angels! Halloween is just around the corner! 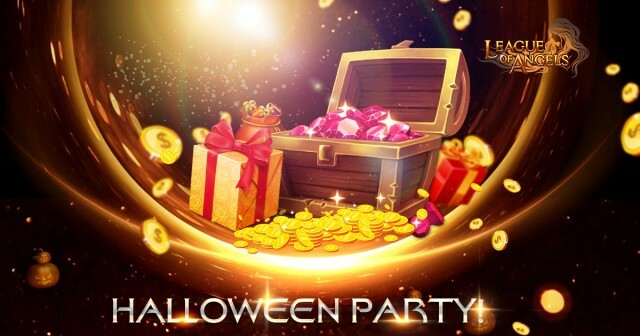 League of Angels is holding a grand Halloween Party where you can earn all kinds of wonderful rewards! Everyone is invited to the festivities, so come have a blast and get some great rewards in League of Angels! From Oct.26th to Oct. 31st (server time), log in game EVERY DAY and you'll get Halloween Morph Candy and hot resources FOR FREE! It's time to build your own Halloween carnival and upgrade your Battle Rating! In the upcoming events, you will have a chance to get abundant Halloween-themed items, such as Magic Broom, Little Bat and the graveyard-themed components! Flip the cards and claim new rewards in Happy Sea! The exclusive Halloween Treasure Chests, which contain powerful weapons and valuable gems, will be available. Dress up in new fashion and be the Pharaoh of the party! The gorgeous Royal Egyptian, which provides a significant increase in stats, will be a good choice for you! Let the ancient power of the Pyramids bless you! From Oct. 26th to Oct.27th (server time), various Armaments will be on sale in Hot Events! Plus a mysterious second evolution Hero will show up following that! From Oct.28th to Oct.31st (server time), there will be "Sylphs Party" in Hot Events! Friendly reminder: The Sylphs will be at a lower cost than before! Stay tuned! More exciting events are coming up from October 25 to October 31 (server time), check them out in the in-game Hot Events menu now! We hope players will have a great time this Halloween and enjoy the celebration to their heart’s content!